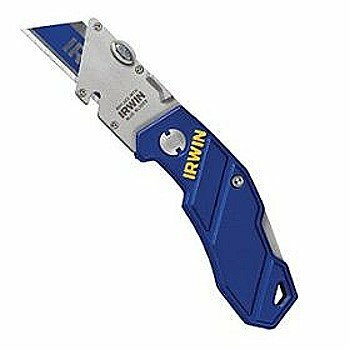 The IRWIN Folding Utility Knife features a quick-change button that allows faster blade changes only when the knife is open at 45° for safety. The folding style and anchored belt clip means this handy box cutter and utility knife goes anywhere it is needed easily while an extended thumb ledge increases control and a wire stripper notch creates more versatility. 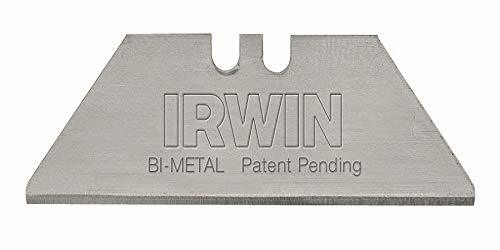 This IRWIN Folding Utility Knife features BladeLock Technology to help keep the blade locked in place. It further helps ensure safety by allowing the user to change blades only when the release button is engaged and the blade holder is in the 45° position. 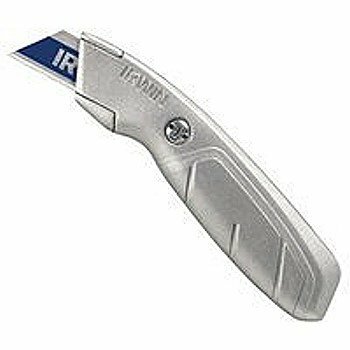 The utility knife features a liner lock for quick 1-handed operation and a wire stripper for added functionality. 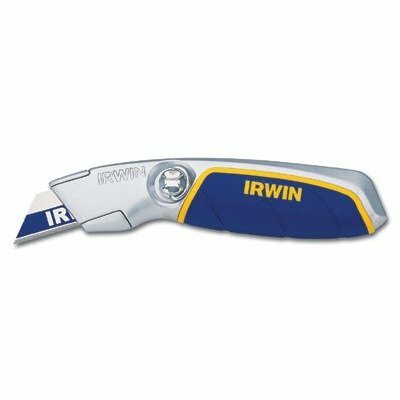 The IRWIN Standard Fixed Utility Knife has an optimized cutting angle to help reduce fatigue and a magnetic nose for easy blade changes. The captured screw design prevents loss during blade change. The utility knife features inside storage for up to 5 utility blades. 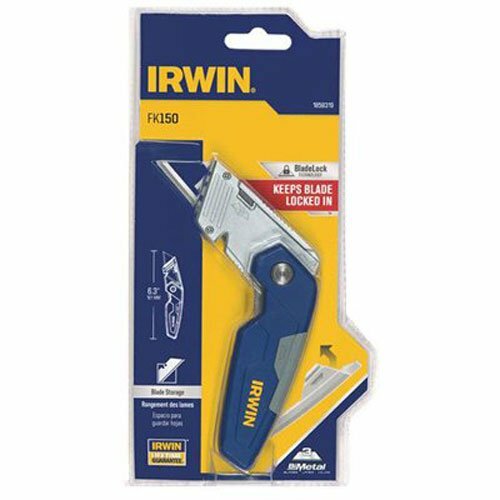 The new IRWIN FK250 with BladeLock Technology is a durable, compact folding utility knife engineered with built-in blade storage, a fold-out screwdriver utilizing 1" insert bits and additional insert bit storage for added convenience and customization. Constructed with a durable, all-metal body design, the FK250 features a liner lock that prevents the knife from closing while in-use for quick, easy one-handed operation. Designed with a removable belt clip, cast finger grooves and a trigger grip handle for greater control; the FK250 delivers maximum durability and versatility. 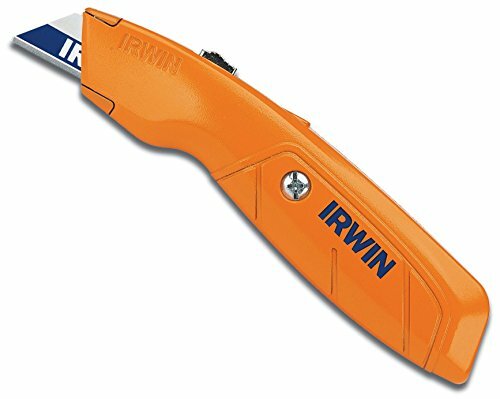 IRWIN Tools 2082300 Hi-Vis Retractable Utility Knife with high visibility orange color makes for easy spotting on the job site. 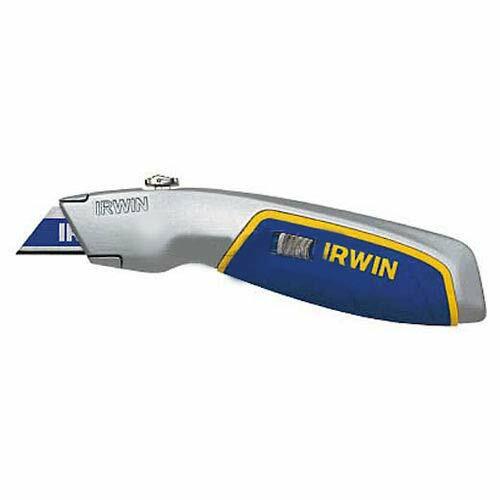 This Irwin utility knife has an optimized cutting angle for reduced fatigue. Smooth, three-position slide exposes variable blade lengths and the handle screw is permanently captured in the casing to prevent loss. This retractable utility knife features inside storage for up to five blades. Includes three unbreakable bi-metal blades. This utility knife is designed with a 19-degree angle and the wider girth and thicker walls of the handle makes for comfortable cutting, even making plunge cuts, and adds durability WARNING: This product can expose you to chemicals which is [are] known to the State of California to cause cancer and birth defects or other reproductive harm. For more information go to www.P65Warnings.ca.gov. 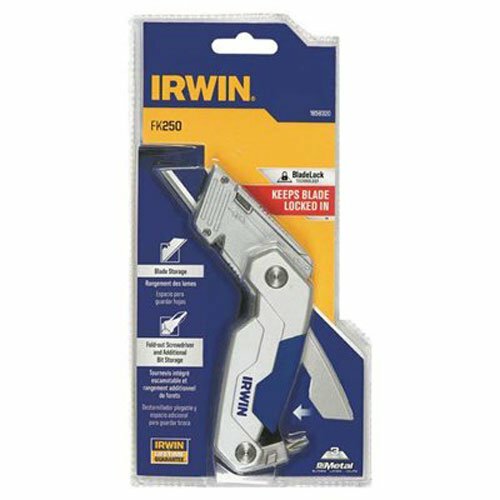 This IRWIN ProTouch Snap Utility Knife features a ProTouch handle for a secure grip and comfort. The auto blade lock and auto blade load functions make it easy to keep the blade fresh, and internal blade storage keeps blades handy. The snap knife comes with an 18-mm bi-metal blade. 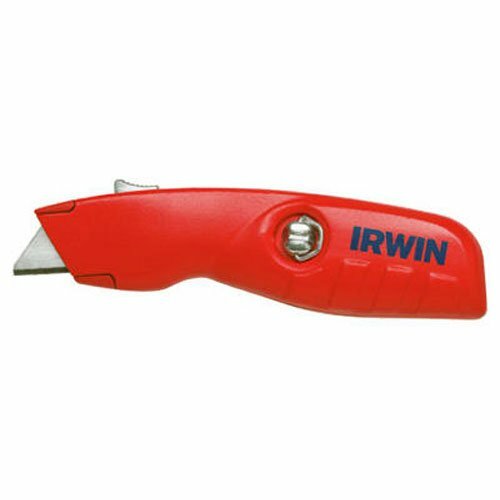 The IRWIN Hi-Vis Retractable Utility Knife features a bright orange color to make it easy to spot on the jobsite or in the toolbox and save time when it's needed. 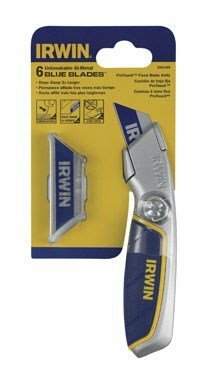 An optimized cutting angle reduces fatigue during repetitive cutting tasks with the three included IRWIN BLUE BLADE utility blades stored in the handle. Handle provides storage for up to five utility blades. Precision ground high carbon steel knife blades. Blade body has knock outs for securing in tool head. Heavy duty carbon steel. 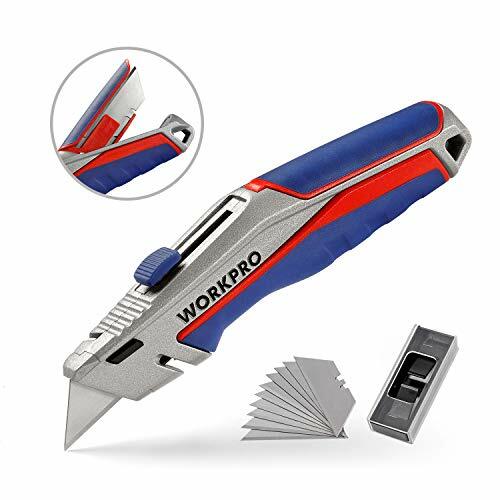 This high-grade utility knife is constructed by Zinc alloy for durability and corrosion resistance, with ergonomic handle for comfort hold and great control. The knife features quick-change mechanism, 4-position retraction, stripping notch, lanyard loop and so on. It's ideal for cutting lots of objects in the work around the house or office. Quick change mechanism allows for easy blade removal without opening the knife. Smooth, three-position slide provides increased durability for frequent use. Easy tool-free entry with push button operation opens the knife and exposes replacement blades. Features inside storage for up to five blades (unbreakable bi-metal blade technology stays sharp three times longer than the next best utility blade). Blades not included. Bulk package only. Standard fixed knife provides optimized cutting angle for reduced fatigue. Magnetic nose for easy blade changes. The captured screw prevents loss during blade change. Included features inside storage for up to 5 blades. 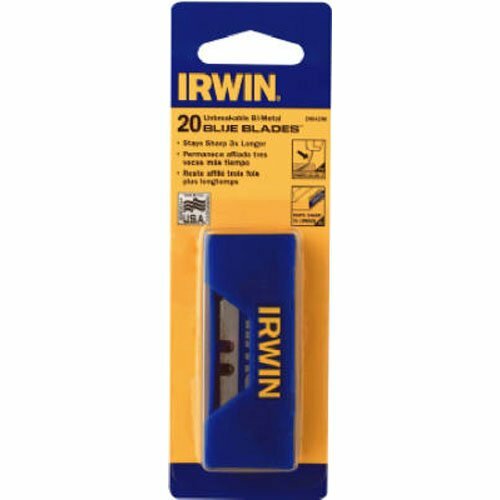 Includes 1 IRWIN BLUE BLADE that lasts 3X Longer and Shatter Proof Bi-Metal. 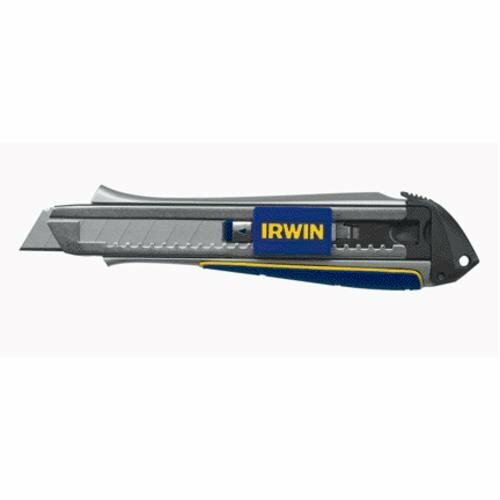 The IRWIN Self-Retracting Safety Knife returns the baled safely into the housing when not in use to reduce injures. 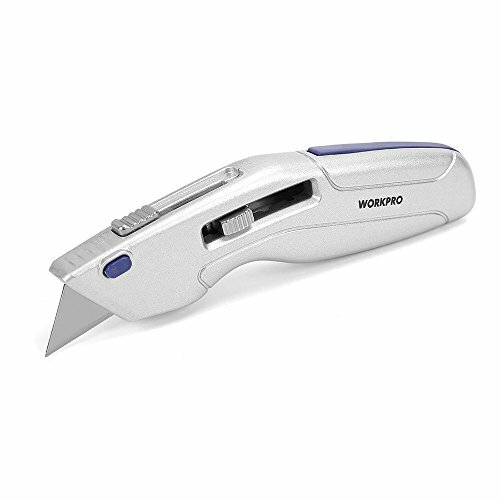 This utility knife and box cutter has an ergonomic grip for increased comfort and an interlocking nose that reduces blade wobble. 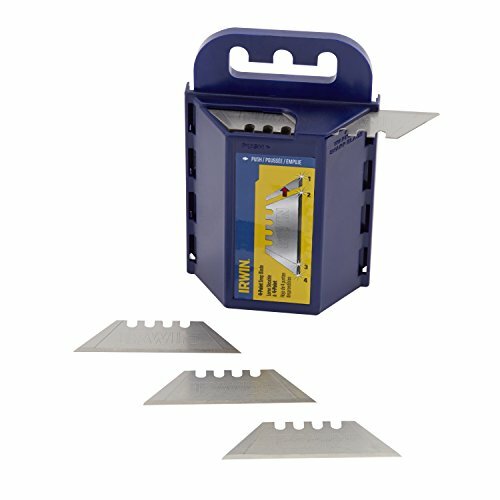 More versatile than traditional safety knives, it is designed to operate in two positions: 2mm extension for box cutting and full extension for general use. Standard retractable knife, with 1 blue Bi-Metal utility blades, optimized cutting angle for reduced fatigue, smooth 3 position slide exposes variable blade lengths, inside storage for 5 blades, screw permanently captured in casing to prevent loss, blades are shatterproof & stay sharper 3 times longer than standard utility knife blades. 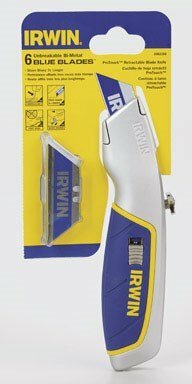 Compare prices on Irwin Utility Knives at LiveSaler.com – use promo codes and coupons for best offers and deals. We work hard to get you amazing deals and collect all avail hot offers online and represent it in one place for the customers. Now our visitors can leverage benefits of big brands and heavy discounts available for that day and for famous brands. We try to makes comparison shopping easy with Product Reviews, Merchant Ratings, Deal Alerts & Coupons. Find Deals, Compare Prices, Read Reviews & Save Money.